Registrations are now open for the new season. It is important to note that players have missed out on being placed in teams in previous seasons due to late registrations. This season all registrations take place in a new online system called “Play Football”. You may need to create a Football Account but the whole process should take less than 10 minutes. As this is a brand new system for Football NSW there may be some teething issues so please raise these with us and we will do our best to follow-up as quickly as possible. Register here to play for the Leichhardt Saints. In 2019 there will be no Under 13 or Under 15 Girls competitions in the Canterbury Association. This has been done to ensure there are enough teams at every Age Group to enable competitive divisions to be formed. If you were due to play in either Age Group than the recommendation is to move to the older group, e.g. Under 15 Girls will play in the Under 16 comp for 2019. Thanks to the Local Sports Grant Program from the NSW Office of Sport we are very pleased to offer free socks and shorts to U6 & U7 players. You will be asked to let us know your size requirements when registering. For all other ages Shorts and Socks are available to be purchased from our on-line store right now. There is also a great range of Merchandise including hoodies, jackets and umbrellas so why not check it out today. All junior players who intend to use the $100 Active Kids Rebate will need to have their voucher number ready before registering online as the amount will be deducted automatically from their Rego Fees. Registrations after the 3rd of February are considered late Registrations. Late registrations will only be accepted in age groups or teams that have space. If parents/players are planning to register as a Coach or Manager it is helpful if you could also do this at the same time as they register themselves or their child(ren) through the online rego system. 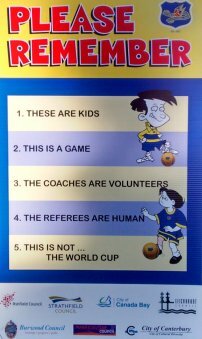 All volunteer Coaches and Managers of Junior teams will need a valid Working with Children Check. Grading generally applies to age groups from Under 8 and older where there are sufficient number of players wishing to grade. Grading of registered players is expected take place over two weeks beginning 12th February at Sydney Secondary College Leichhardt; players should attend all weeks. A schedule is now posted on our website here. The grading process ensures players are in teams with others of a similar standard, as well as helping to select the players for the highest graded team(s) in each age group. It is therefore requested that new players attend the trials, however grading is not compulsory.